Ann wished me a happy birthday this morning, reminding me that I am now 365 days away from turning 40. This was the first time I have actually felt a twinge of disappointment at being reminded it was my birthday! As a guy once said, soon it will time to start counting backwards. 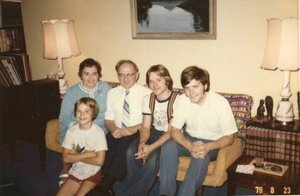 This picture is of Mom, Dad, Paul, Jim and myself in the summer of 1978. Oldest brother Tom must have been in Jamaica at that point. Jim was just back from the Peace Corps in Guatemala and Paul was going into his junior year at Cornell. This must have been that tripod camera my father had with the timer, where he’d set it and run like hell back to the sofa before the flash bulb went off. Feliz cumpleanos, Phil! Glad to see you are blogging on a semi-regular basis again. I’m visiting family in South Dakota at the moment, and can relate to the group photo. Just got done watching a very satisfying Yankees-White Sox game on Fox. I stumbled across your blog while I was doing some online research. I think all of the “milestone” birthdays (30, 40, 50, etc) give us all a bit of a jolt as we’re entering an entirely different decade of our lives.